Even the questioner couldn't believe what he was hearing. The questioner on ABC's Q&A wasn't the only one who was visibly shocked by Steve Price's comments. Steve Price drew a united gasp from the Q&A panel on Monday night and sent Twitter into overdrive when he accused Guardian columnist, playwright and novelist Vanessa Van Badham of getting "hysterical" over domestic violence. An emotional Van Badham was responding to a question on attitudes towards domestic violence. 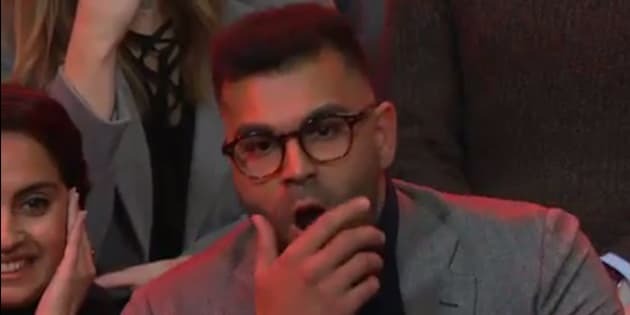 Questioner Tarang Chawla -- who is an ambassador for Our Watch, White Ribbon and The Safe Steps Family Violence Response Centre -- brought up the Eddie McGuire drowning controversy, which made headlines again last week when Sam Newman defended McGuire's comments. "My sister Nakita was stabbed to death by her partner in January last year with a meat cleaver. She was 23," Chawla told the panel. "How will politicians and the media play a better role in bringing about long overdue cultural shifts so tragedies like what happened to my family are not normalised?" After pointing out that he knew Eddie McGuire "well," Price went on to describe the comments as "a joke" and "a bunch of blokes laughing about things they shouldn't have laughed about". "All of them apologised. I think far too much was then made of it," he said. In response, Van Badham shifted the conversation to focus on the cultural attitudes around treatment of women in Australia and claimed Price's description was one that allowed for the acceptance of violence. "First can I say it's absolutely heartbreaking to hear about your sister. It's one of the reasons why we have to take this seriously," she said, clearly emotional. "It's devastating to hear that. I'm so sorry." She went on to discuss the need to end the "cultural attitudes that treat women differently" and where domestic violence is no longer seen as "jokes made by a bunch of blokes". Price was quick to take offence. Speaking over the top of Van Badham, he said "Just because you're a woman, you're not the only one who can get upset about this." As the audience drew a united gasp of shock, he went on: " Men can be just as upset about these things." Van Badham was quick to respond. "Thank you. You're proving my point very excellently," she said, drawing loud applause from the audience. As Van Badham attempted to get back on track responding to Chawla's question, the 2GB announcer took another swipe. "I think you're just being hysterical," he said. "It's probably my ovaries making me do it, Steve," shot back a quietly fuming Van Badham. It was then that host Tony Jones stepped in to diffuse the situation, turning the question to the rest of the panel with the foreboding phrase "I think the public can make up their own minds about that". And so the public certainly has. Defenses of Van Badham and outrage at Price's comments flooded the Q&A Twitter feed following the heated exchanged, with some even going as far as calling on Channel 10's The Project to sack Price. The hashtag #callmehysterical also surfaced as Twitter users spoke up in support of Van Badham and domestic violence sufferers. Van Badham's quick response to Price's comment is particularly poignant, given the origins of the word "hysteria", which means "of the womb" in Latin. The medical term 'hysteria' was thought to be caused by the uterus. For almost 4,000 years of the patriarchial West's history, hysteria was a medical condition thought to affect women, whereby they became overly emotional and incapable of rational thought. The term wasn't dropped by the American Psychiatric Association until the 1950s. However, it was Van Badham who had the last word, tweeting a selfie with fellow panelist and Deputy Opposition Leader Tanya Plibersek after the show with the words "Feminism is solidarity. Run dinosaurs, run". On a Q&A full of vocal debate on many weighty political and social issues -- including the right to vote, the Chilcot Report and possibility of Tony Abbott's inclusion in the next Federal Cabinet -- it is Steve Price's comments which will be discussed over tomorrow morning's metaphorical water coolers.